One of the things that Passion Week helps us to see (mentioned yesterday) is that Jesus was not a victim but a volunteer. 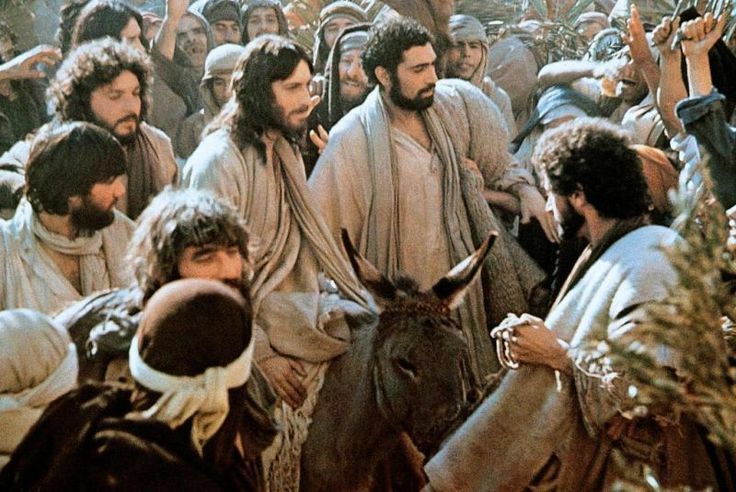 Today is Palm Sunday, and Jesus is traveling with his friends. After the Sabbath, Jesus and the disciples walked from Bethany NW through Bethpage to Jerusalem, a journey of 8-10 miles. He rode the last part on the colt of a donkey, fulfilling this prophecy from Zechariah 9:9, “Say to Daughter Zion, ‘See, your king comes to you, gentle and riding on a donkey, and on a colt, the foal of a donkey.” As he approached, “A very large crowd spread their cloaks on the road, while others cut branches from the trees and spread them on the road. The crowds that went ahead of him and those that followed shouted, “Hosanna to the Son of David!” “Blessed is he who comes in the name of the Lord!” (Matthew 21:8-9, NIV). Even so, Luke 19 tells us that he wept compassionately over Jerusalem as he approached the city. Some Greeks came to see Philip, who took them to Andrew, who helped introduce them to Jesus. (We don’t know much about Andrew, but we could all do a lot worse than to be remembered as someone who introduced people to Jesus!). This is one of the clear signals indicating that Gentiles will be included in the New Covenant. It is an interesting fact to be included about the triumphant entry of a Jewish Rabbi… Why even speak about Greeks at such a time? Shortly after meeting them Jesus announced, “When I am lifted up, I will draw all men to myself”, indicating that these Greeks and “all men” were included in his crucifixion and his kingdom. It’s interesting to note that Jesus taught his disciples several times that he was going to die, that he was a volunteer and not a victim. Jesus was on a mission, and he was proclaiming it to everyone. Another notable statement that Jesus made in front of his followers outside of Jerusalem: ““Now my soul is troubled, and what shall I say? ‘Father, save me from this hour’? No, it was for this very reason I came to this hour. Father, glorify your name!” (John 12:27, 28, NIV). Knowing what was to come, he is troubled but not desperate; he is aware but not anxious. He knows exactly what he came to do and what his purpose is. He is not a chance victim, swept along the current of events, wishing that God would save him from this fate. He is a man on a mission who plans to see it through. The Question Is, What Do YOU Believe About the Cross? Luke 17:2 [Jesus taught them] But first He must suffer many things and be rejected by this generation. What do you believe about the cross? Was Jesus a victim or a volunteer? While the cross is history, it’s also a bit of a mystery; What caused the crucifixion? Some say it was caused by politics in the area; others claim it was mob hysteria. Was it Jesus’s heresy? The Pharisees’ jealousy? Herod’s legacy? Judas’s zealotry? Was Jesus swept along by a current of events, or was he in control of everything? Was he a Rabbi who overplayed his hand, or a King who had total command? Was he a mistreated milquetoast, or a man on a mission? The cross wasn’t circumstantial; it was strategic. For Jesus the cross wasn’t by chance, it was by choice. It wasn’t based on an accident; it was based on his authority. It wasn’t a random disaster; it was a deliberate design. He knew about it; he talked about it; he prophesied about it; and he prayed about it. For Jesus, It wasn’t unexpected; it was premeditated. The cross wasn’t coincidental; it was calculated. It was not incidental, and it wasn’t accidental; it was intentional. It wasn’t capital punishment, it was cosmic punishment. Jesus allowed the Pharisees to plot, so he could do for us what we could NOT. He allowed the Romans to execute him, so he could execute God’s plan. He wasn’t laid low, he was lifted up. He wasn’t horrified, he was glorified. Jesus wasn’t a victim of circumstance; he was a voluntary sacrifice. What do you believe about the cross? they could have ever sent, could never have taken the King of Kings against His will. He was a powerful leader committed to salvation!